Retirement Wishes for Colleagues: Instead of cliché greeting cards, flowers, gifts and emails, wish your colleagues a happy retired life by writing inspirational quotes on post-it notes. Stick them up on their desks on their last day of work. Follow it up by tagging them in cute tweets to say congratulations. Hop over to Pinterest and share a few funny pins about getting old. And when the time comes for a farewell speech to goodbye, make sure you use the right words to raise a toast that leaves a sweet aftertaste. Get the whole office together and take a group selfie to mark the end of a long career and a professional journey. Go on, pamper your retiring colleagues – let them retire with the most awesome memories. 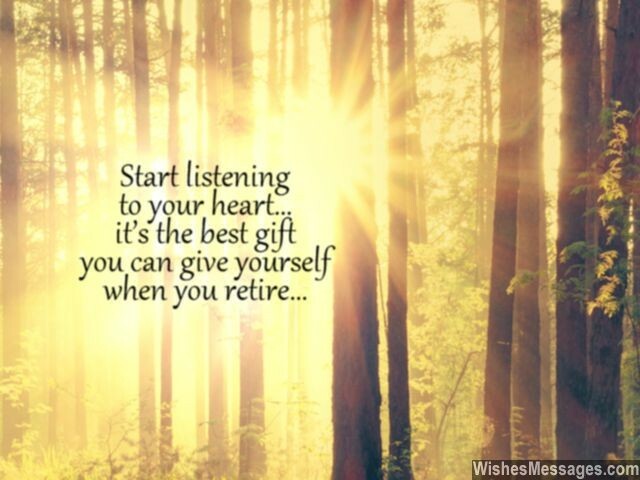 1) Start listening to your heart… it’s the best gift you can give yourself when you retire. Congratulations. 2) Your retirement actually means that you got promoted to one of the best roles in your life. Congratulations. 3) All your life you were wondering why you tolerated an annoying boss and put up with irritating colleagues – retirement is the answer. Congratulations. 4) Morning coffees will finally be what they are meant to be – relaxed and de-stressing. Happy retirement. 5) Forget #ThrowbackThursday and #FlashbackFriday – now you have all the time in the world to lie on a hammock and think about the beautiful memories of your life. Congratulations on your retirement. 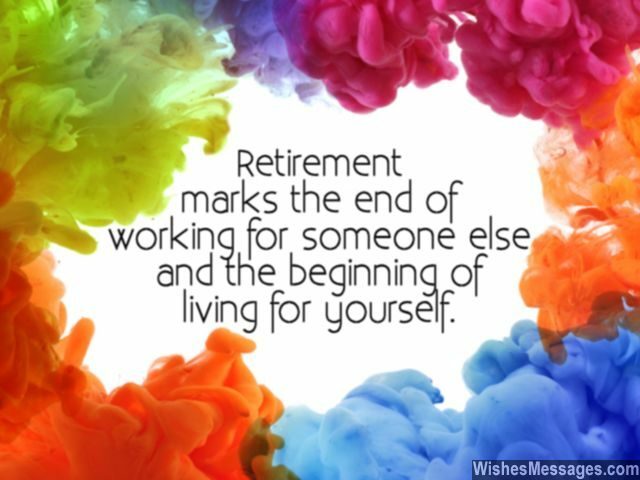 6) Retirement marks the end of working for someone else and the beginning of living for yourself. Congratulations. 7) Now you have no excuses for not having enough time for posting selfies with grandkids. Congratulations on retiring. 8) Retirement is your chance to be true to your own self. It is an opportunity to pick up forgotten hobbies and nurture the little kid within you. After all, it’s never too late to start living the life that you have always wanted to. 9) No more targets, no more goals, no more KPIs and no more meetings. All there’s left to do now is to unfurl all the happiness that life has in store. Congratulations on your retirement. 10) The lights have dimmed and the cameras have stopped rolling. Life has yelled Pack Up, but there’s still time until The End. Congratulations. 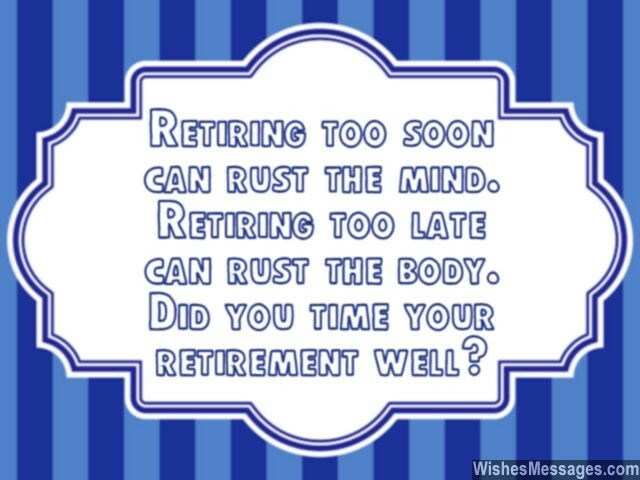 11) Retiring too soon can rust the mind while retiring too late can rust the body. Did you time your retirement well? 12) Relax and have fun, but don’t let retirement douse the fire in your belly. Farewell and goodbye. 13) Retirement is when life gives you the greatest reward there can ever be – peace of mind. Congratulations. 14) Retirement is the best time to spend all your savings – they aren’t going to be of much use later. Congratulations. 15) Retirement is an opportunity that life gives you to stop complaining about not having the time or chance to do what you always wanted. Congratulations. 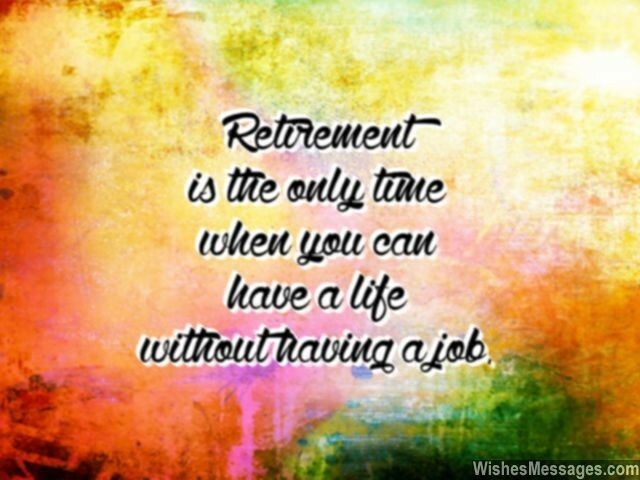 16) Retirement is the only time when you can have a life without having a job. Congratulations. 17) No facades, fake smiles or charades – retirement is all about being who you are without a worry in the world. Congratulations. 18) Don’t worry about setting a budget for your retirement. Just focus on setting a timelines to fulfill all your dreams. Congratulations. 19) The first destination you should travel to after retirement is a beautiful, elusive island cut off from the rest of the world – it’s called Happiness. Congratulations. 20) The main course of your life has been amazing. Now finish it off with a classic dessert. Wish you a happy retirement. 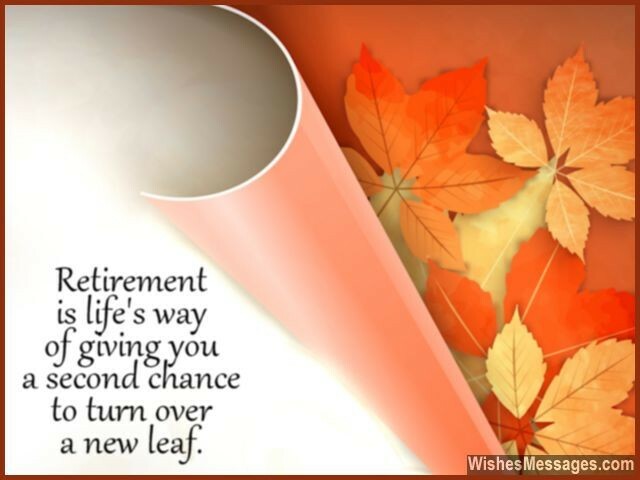 21) Retirement is life’s way of giving you a second chance to turn over a new leaf. 22) Retiring is like falling in love for the first time. Thinking about it gives you butterflies in the stomach and you will never know how it feels until you actually retire. Happy retirement. 23) It’s okay to be sad about your retirement, but it is much better to be happier about the awesome days that lie ahead. Congratulations. 24) Retirement is life biggest irony – you’ll get bored soon and start looking for jobs to do. 25) You may have got many promotions throughout your career, but the best perks of your life star now as you spend more time with your friends and family. Congratulations on retiring. 26) Don’t retire with regrets of what you couldn’t do. 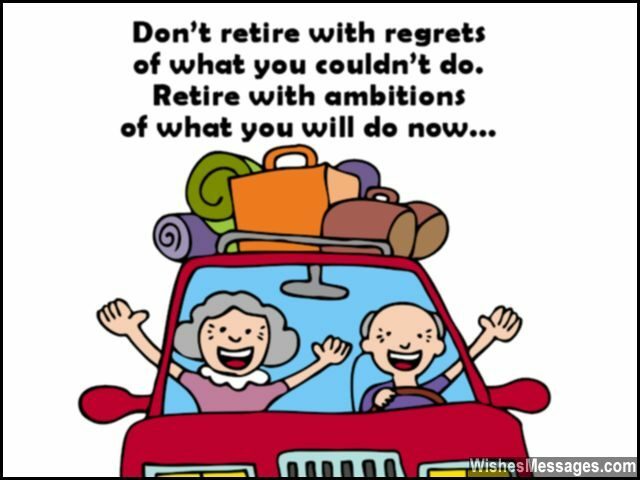 Retire with ambitions of what you will do now. Congratulations. 27) Just because the word tire is a part of retire, it doesn’t mean you actually have to tire of life. Have an awesome retirement. 28) Stock up with lots of drinks, good music and delicious food – the biggest party of your life is about to start. Happy retirement. 29) The best things in life come unplanned or unexpected. So why plan for retirement? Congratulations. 30) Retirement is the moment when all your favorite colleagues turn into your best friends. 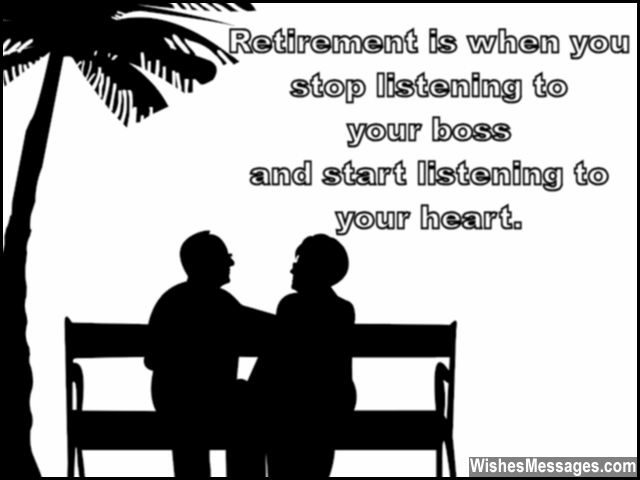 31) Retirement is when you finally stop listening to your boss and start listening to your heart. Congratulations. 32) Retirement is life’s biggest irony. You’ve got all the free time in the world to do whatever you like, but your aging body will probably refuse to do most of those things. Have fun! 33) Retirement is not about giving up, losing yourself, slowing down or feeling old. Retirement is about enjoying the longest holiday of life. Farewell. 34) Planning for retirement is like planning your first ever date. No matter how meticulously you plan, nothing will actually happen according to plan but you’ll still love it. Congratulations. 35) Life tends to give happiness in installments – the biggest and best one being right up ahead. Congratulations on retiring. 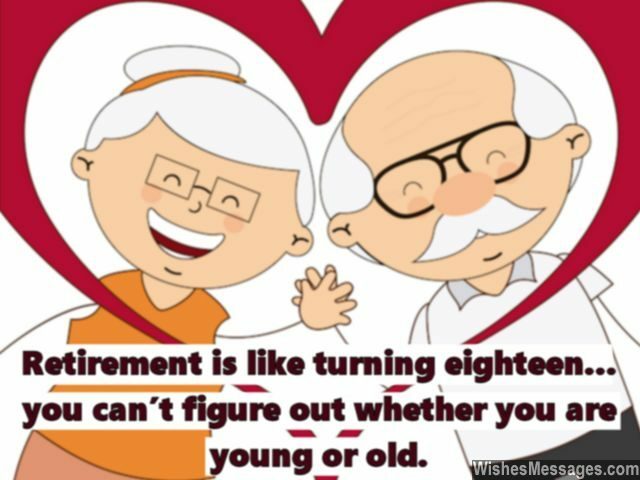 36) Retirement is like turning eighteen – you can’t figure out whether you’re young or old. Congratulations. 37) Retirement is the epilogue of your life. Write it well. Congratulations. 38) Thanks for everything you’ve done for your colleagues and the company. Decades of hard work have finally culminated into a beautiful feeling called retirement. 39) Pre-retirement means 9 to 5 under your boss. Post-retirement means 9 to 5 under your wife. Farewell. 40) People retire because they reach a certain age, but businessmen like you can retire because they’ve reached the zenith of success. Congratulations.